There has been a lot of talks about the ongoing craze of the 10-year-old challenge on social media, where people are posting and comparing themselves and different things from how they were in 2009 to how they are in 2019. Following the bandwagon, we’ve tried to accept the challenge in our way. 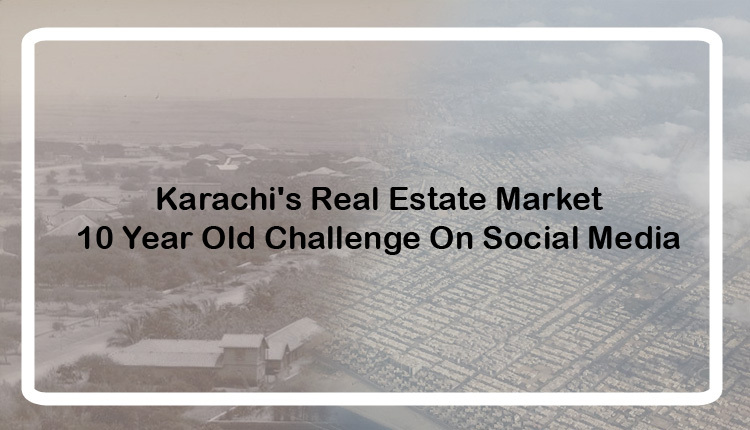 Therefore, today, we’re going to discuss the performance, fluctuations, and trends of the real estate market of Karachi in contrast with how they were back in 2009. We will see how and what aspects of the real estate market has been changed during the span of 10 years. Before going into the details of the major areas of the city, let us go through a brief overview of how the city’s real estate market performed in the past 10 years. The market was down after the General Elections in the country in 2008. The main reasons behind this recession were an unstable political situation, downfalling economy and widespread wave of terrorism across the country. The situation turned bad to worst during the PPP tenure of 2008-2013. The mass-level corruption and worsening security conditions in the country not only hurdled local and foreign investments but also made it difficult for local industries to sustain their operations in the country particularly in Karachi. In 2012, the country saw its first ever successful democratic transfer of power. The PPP era ended and PML(N) won the general elections 2013. This peaceful democratic process stabilized many factors related to different industries. Peace and stability returned to the country’s economic hub Karachi. Economy gradually started to improve. Similarly, many concerns about the stability of the real estate market have been addressed. In result, the real estate market started to boom in 2013. The market saw massive progress onward. Real estate industry was effectively gaining Investors’ confidence. Many builders announced their new projects, existing investors were also satisfied with the market’s standing until 2016. The new tax reforms announced by the govt in June 2016 thrashed the market boom. After the tax reforms, the market continuously saw a downward graph. The falling market found the ray of hope after the PTI formed its government after general elections 2018. But the bubble of hopes got burst when the newly elected government imposed restrictions on nonfilers from purchasing the property. This decision turned out to be the final nail in the coffin of the falling market. Since then, the market is suffering from severe recession till the date. Plot prices in Karachi kept increasing regardless of the overall ups and downs of the real estate industry. However, prices reached their peak of 10 years in 2016, just before making the downward trajectory that still exists till the date. Gulshan-e-Maymar’s progress was surprisingly showing upward trend throughout its journey of 10 years. The society has all in all gone through 13 phases of development and extension. Its covered area is around 1000 acres. As per the estimation, the population of Maymar at the moment is 45% of its optimal capacity of 100,000. Gulshan-e-Maymar has seen major growth in recent years due to its quaint setting, decent amenities, and relatively less noise and air pollution, and connectivity with one of the major freeways of the country. The township’s healthy growth has caused an exponential appreciation of property prices within it. We predict that Maymar will continue this trend in the near future as evidenced by the upward projections and the lack of alternative townships with the same caliber of amenities and facilities. Bahria Town was the booming identity in the real estate of the city. With the number of luxurious attractions and well-reputed name, the project was largely enjoying the trust of investors, particularly from Pakistani expats. The spell of progress was broken by the series of controversies that hit Bahria Town first time back in 2015 when Pakistan Rangers revealed that Bahria Town has been allotted 44,000 acres from Sindh government, while the amount of land in records is less than 44,000 acres. Since then, Bahria Town is seeing a consistent declining graph until the date. The cases against them are still in court. If they succeeded in getting a clean chit from the supreme court during the first quarter of 2019, we can say that they will be going to boom once again. DHA has been another center of attraction for local and expat investors. It succeeded in maintaining its status as one of the favorite choices for investors and genuine buyers looking for property in posh areas. DHA City is the major contributor in the successful journey of the last 10 years of DHA. As shown in the graph above, DHA city saw the massive boom in 2013 and reach its peak in 2016. After June 2016, the overall fall of the market also affected the DHA city’s progress and left it with a declining graph which is consistent till the date. Here is the detailed data of DHA City regarding the difference between peak prices and current prices.